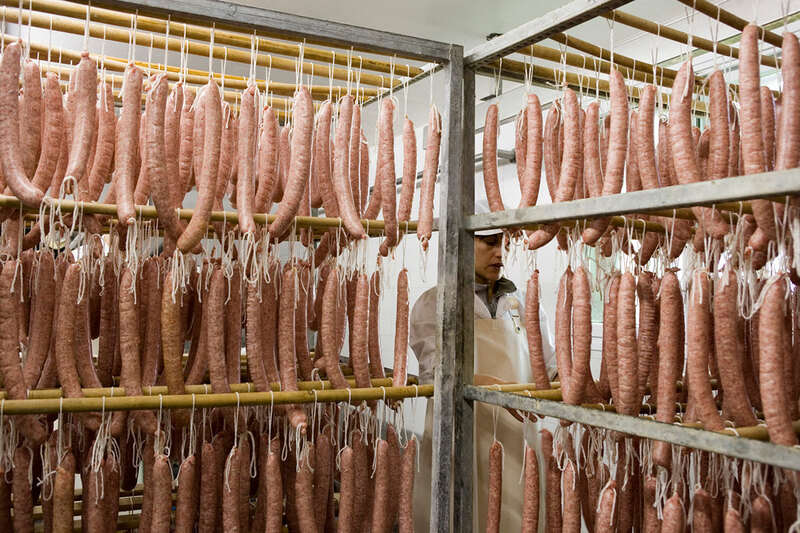 The cold meat/sausage factory springs from the need to offer our clients a level of quality and unique characteristic of our products with the greatest reliability. Our aim is to achieve top quality products beyond quantity, and we do so by producing small batches and by establishing quality controls that allow us to manage all stages of the manufacturing process. In this way we can guarantee a genuinely home-made sausages. They are products that have been produced with the finest parts and pork fat. These products are salted, seasoned, matured and they finish their production process by drying in conditions of temperature and of controlled humidity in our drying rooms at Fussimanya. Description: This is a product resulting from the selection and selection of the best pork and sow meats, as well as the application of a careful elaboration process that results in the sensations that the tasting of this sausage provokes. 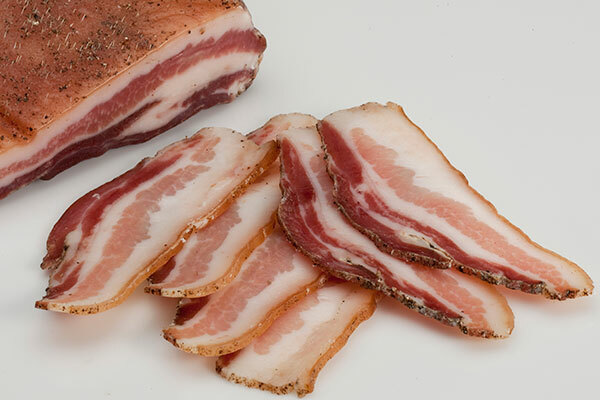 Of traditional aspect, this product allows to taste a meal of excellent organoleptic characteristics and that are expressed in a flavor of ripe meat in mouth and unctuous texture caused by the cubes of bacon. 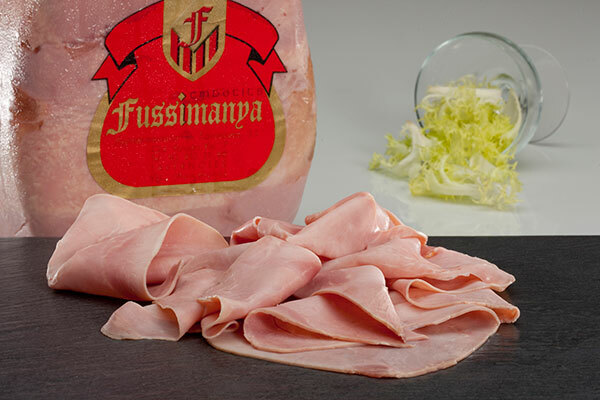 Finally, Fussimanya has managed to express in a very faithful way, the principles that give meaning to his style, based on the combination of tradition and modernity. 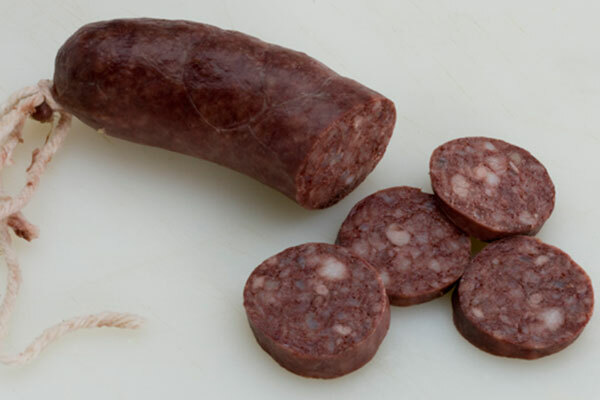 Description: product that uses the same meat mixture as the extra Fussimanya sausage. The fundamental difference is found in the gut that is used, since it allows a slower healing of the product, reaching a healing time of more than 45 days. This fact allows to obtain wider and uniform formats, as well as more marked organoleptic characteristics. Formats: whole piece without packaging · Whole piece of vacuum · Entire piece wrapped · Piece packed in wooden box (pieces of 350g or 450g). Description: this product has a great recognition by our customers. 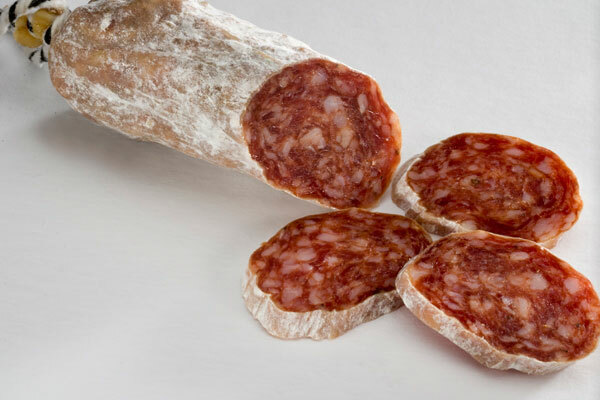 It is made from the finest meat of the pig, softened with fat dices which give this dry cured sausage its traditional image. The curing area makes this product take on some peculiar characteristics expressing itself in its excellent aroma and bouquet. Packaging Formats: unpackaged extra whole piece • Vacuum-packaged whole piece • ½ piece vacuum-packaged• 100g sliced portions packaged in a protective atmosphere• Wrapped • In a wooden box. Description: the naming of this product comes from the natural casings used in its production. 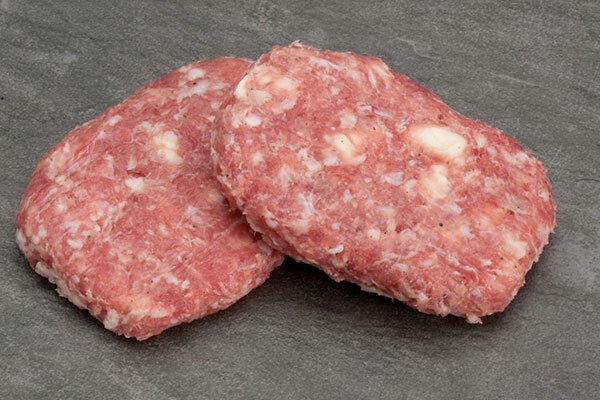 The fat content of these casings and the characteristics provided by the meats used in the production process are the best allies for the slow curing process to which it is subjected. 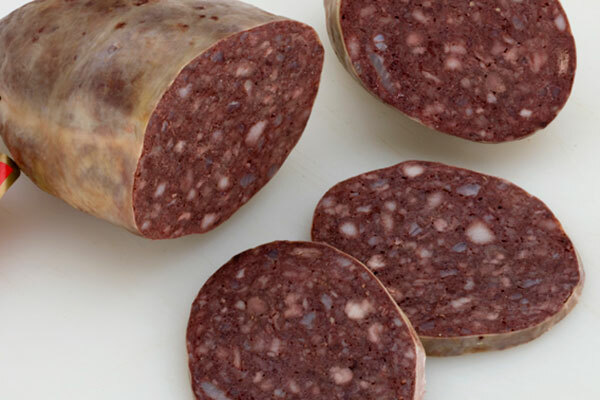 All this, together with the traditional appearance of the product, makes it a much-appreciated food for the nostalgics of homemade dry cured sausages. Packaging Formats: unpackaged whole piece• Vacuum-packaged whole piece • Vacuum-pacagked ½ piece • 100g sliced portions packaged in a protective atmosphere• Wrapped • In a wooden box. Description: it is made of a selection of pork meat and pork fat, flavoured with salt, spices and sausage in natural casings. The curing process provides the aroma and typical taste which makes it a very attractive product suitable for the best snacks and sandwiches. Packaging Formats: unpackaged whole piece • Vacuum-packaged whole piece. Description: this product features the characteristic shape of a necklace. 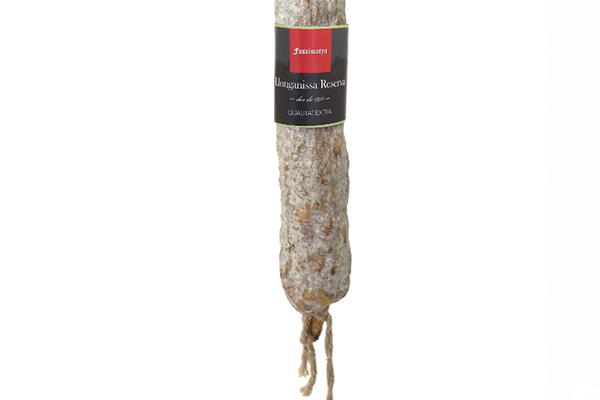 This format has its origin in the curing process of the ‘botifarra’ raw sausage, which gives it an essence of traditionality. 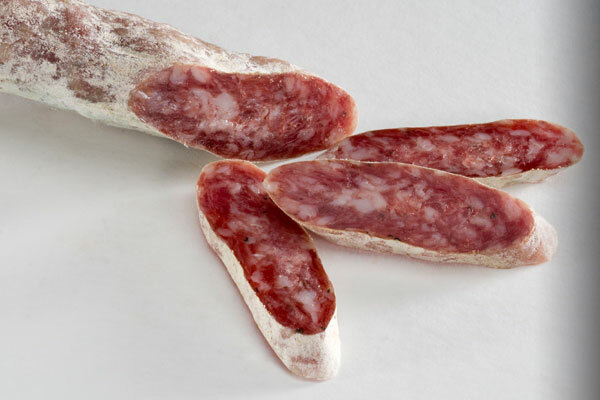 Therefore it is the perfect product to be part of dry cured sausages board. 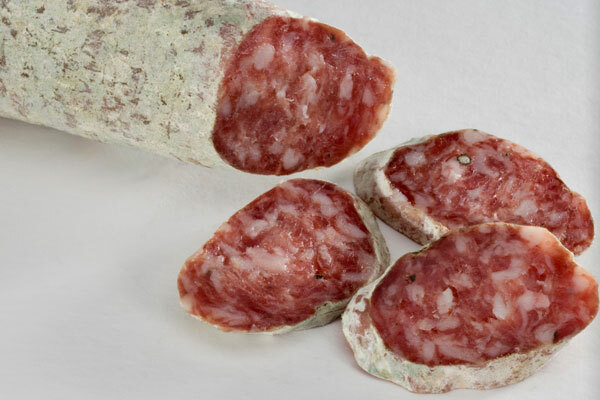 Description: The origin of this product is found in the drying of raw sausages, so it keeps the shape of a necklace The short curing time makes it a mild product without skin and, at the same time, it keeps the organoleptic characteristics of the meat, but, in this case, dry. It is a very sweet and perfect product to make you feel less hungry between meals. Description: it is a product with particular characteristics. 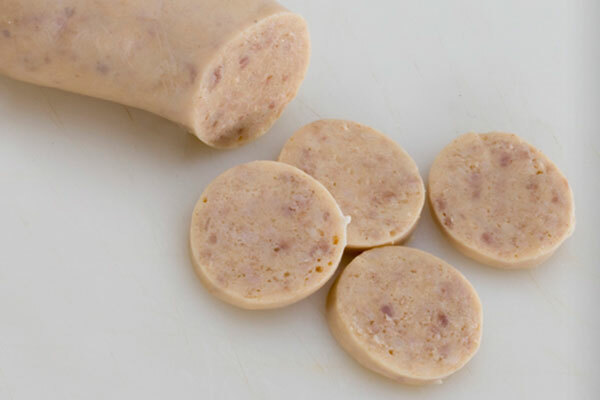 It is made of 50% ‘salchichón’ and of 50% best sausages. This special composition gives this product a strength very much appreciated by a wide range of customers. Mild taste, sweet and inviting are its basic characteristics to be part of the best hors d’oeuvres. Packaging Formats: unpackaged whole piece • Vacuum-packaged whole piece • Vacuum-packaged ½ piece • 100g sliced portions packaged in a protective atmosphere. 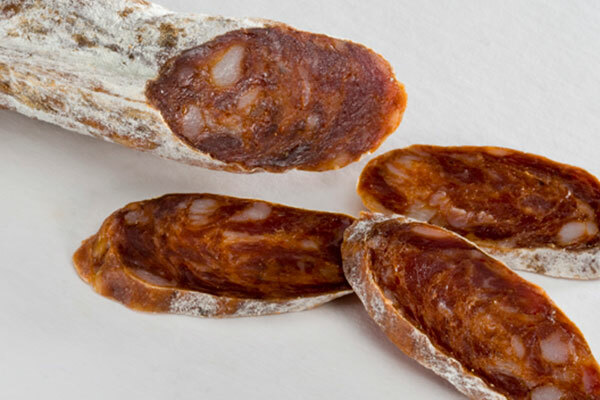 Description: this extra chorizo is made of the finest pork meat, it has fat and is flavoured with salt, species (the sweet red pepper stands out) giving its specific and particular organoleptic characteristics of this product. Suitable for appetisers and dry cured sausages boards (‘necklace’ format) and suitable for sandwiches (wider format). 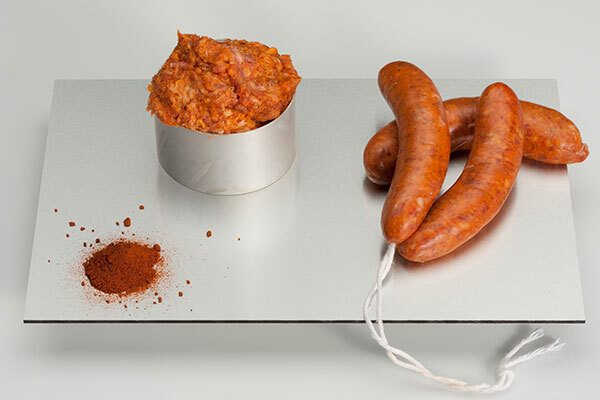 Description: this chorizo ‘collaret’ (necklace shaped) has organoleptic characteristics similar to the wide chorizo, but the collar shape and its narrower size makes it a product with a faster curing process. 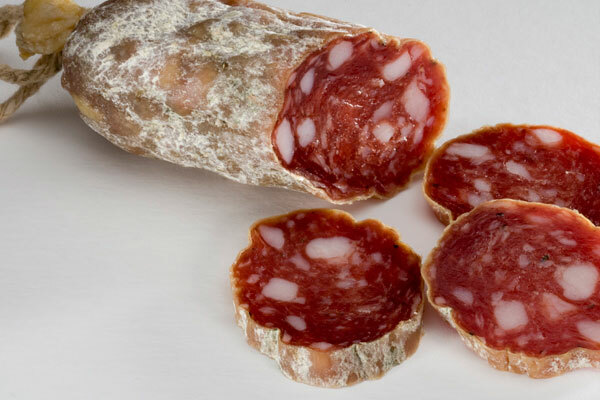 These special characteristics make it perfect to be part of the best appetisers as well as of the best traditional dry cured sausages boards. Description: the process of making our ‘sobrassada’ is similar to the process used for the ‘sobrassada’ from the Balearic Islands but its special characteristic is the fact that our ‘sobrassada’ is cured in our region. Its characteristics and formats make it an ideal product to eat sliced, on top of a toast, in a salad, for cooking or as part of a delicious sandwich. Description: after a good selection of pork loins, they undergo a marinating process with salt and black pepper. The slow curing process of this product and the quality of the meat make it a product containing the best organoleptic characteristics. Due to its properties, it is a good product to make sandwiches, salads and hors d’oeuvres. Packaging Formats: unpackaged whole piece• Vacuum-packaged whole piece• Vacuum-packaged 300g approx portions •100g sliced portions packaged in a protective atmosphere. 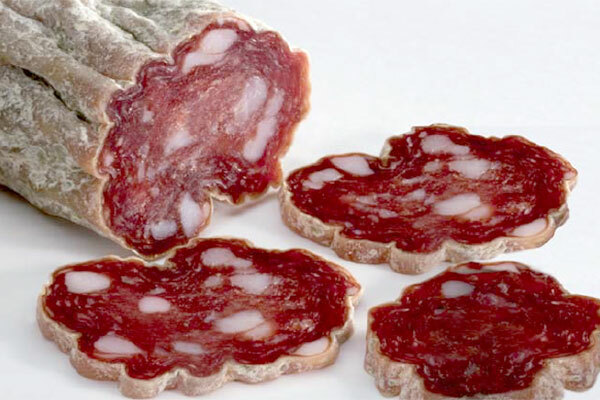 Description: the use of red pepper in the process of production and curing gives this cold meat a unique personality and characteristics. The sweetness touch and the colour provided by the red pepper, make it an appealing and very sweet product for the palate. It can be used for snacks or to prepare hors d’oeuvres, among others. Description: this is a salted product which is dried after a time of rest. This process allows obtaining a traditional product very much appreciated as a complement to typical dishes and particular dishes from the Catalan cuisine. Packaging Formats: unpackaged whole piece• Vacuum-packaged whole piece• ½ Vacuum-packaged piece • Vacuum-packaged 300g approx portions. 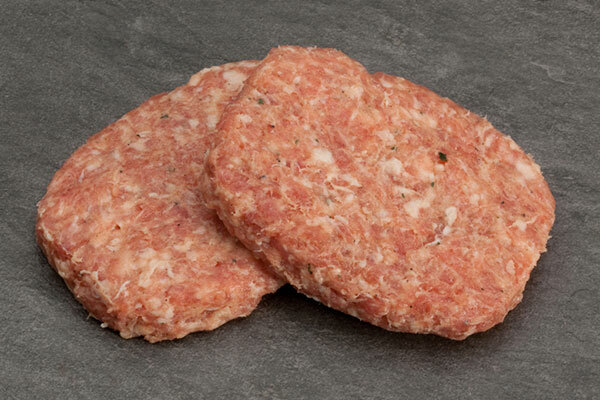 These products are made of meat, fat and pork giblets that have undergone a heat treatment, either in a boiler or in an oven in order to leave them ready-to-eat. Description: this is one of our flagship products. Its production consists in the cooking of the best meat parts of the pig, accompanied by kidneys, tongues, etc. and stuffed into a natural casing. Once it is cooked, the mixture is homogeneous to the view but varied to the mouth, since the different textures that you notice in the palate give you an idea of the original content of the product. Packaging Formats: unpackaged whole piece• Vacuum-packaged whole piece• Vacuum-packaged ½ piece • 100g sliced portions packaged in a protective atmosphere. Description: this product is made of the best pork meat pieces combined with blood. During the cooking, the coagulation of existing proteins in the blood happens and this is the reason for its colour and its typical characteristics. This product can also be eaten after a curing time in a drying room. 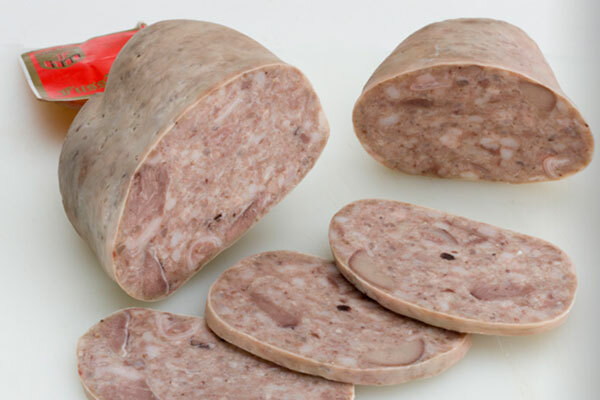 Description: this product is made of meat, pork fat, egg and cold meat in its natural casing. It is the highest expression of the combination of pork meat pieces and egg. The properties of eggs, once cooked, provide an aroma and spongy texture to the product that makes it very pleasant to the palate. Description: the origin of this product is found in the domestic slaughter of pigs which are very typical in our territory. 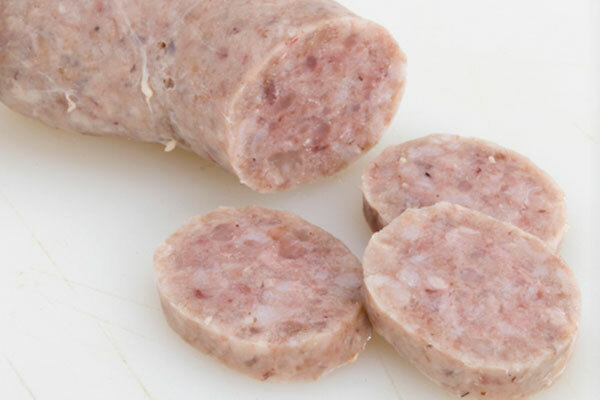 The cooking of the meat and the pork fat make this sausage become a product that is soft and pleasant to the palate and, at the same time, releases the best aromas of the cooked meat. Description: this product is made of meat, fat and pig blood. This mixture gives its characteristics which are very similar to the Black ‘Bisbe’ but its format makes it the ideal complement for homemade soups and a perfect companion for a good assortment of ‘botifarres’ (Catalan sausages). Packaging Formats: unpackaged whole piece• Vacuum-packaged whole piece. 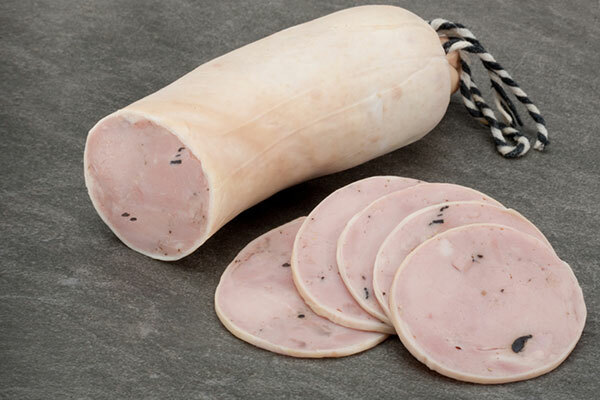 Description: this product is made of the best selection of pork meat. This product preserves the same recipe and traditional preparation and this fact is expressed in its organoleptic characteristics. 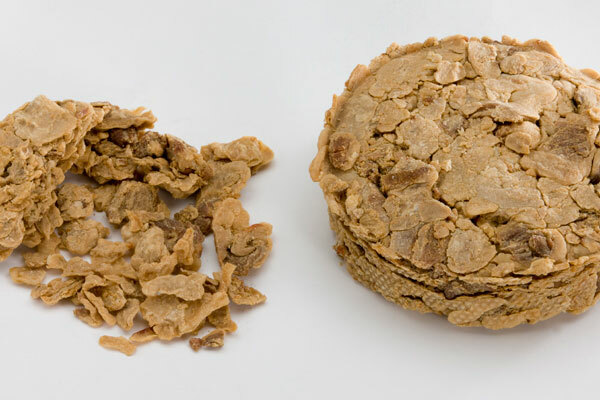 It is considered as a deli product, especially in its combination with the truffle, placed on the market under the name of ‘Catalana Trufada’ (Truffled Catalan). Packaging Formats: Vacuum-packaged whole piece• Vacuum-packaged ½ piece• Vacuum-packaged 300g aprox portions. 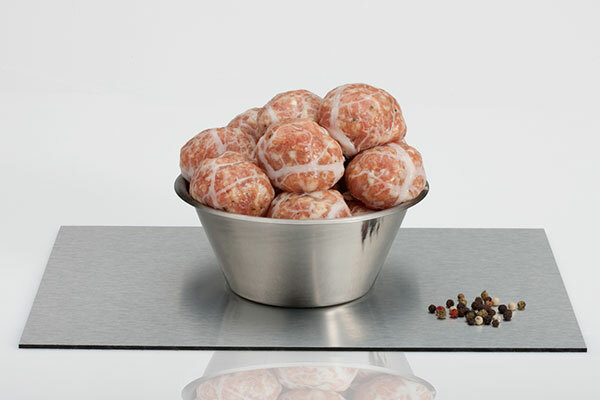 100g sliced portions packaged in a protective atmosphere. 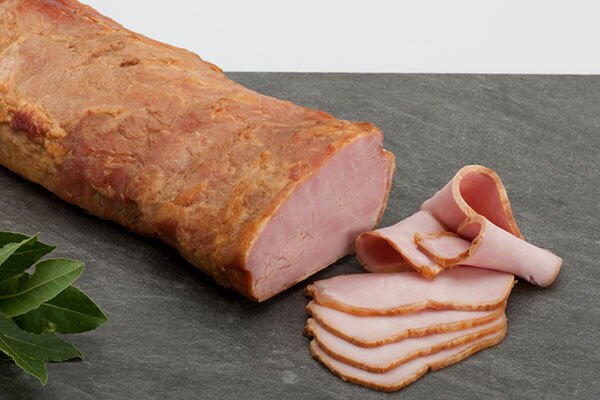 Description: this product is part of a good selection of hams to make a product of excellent quality. 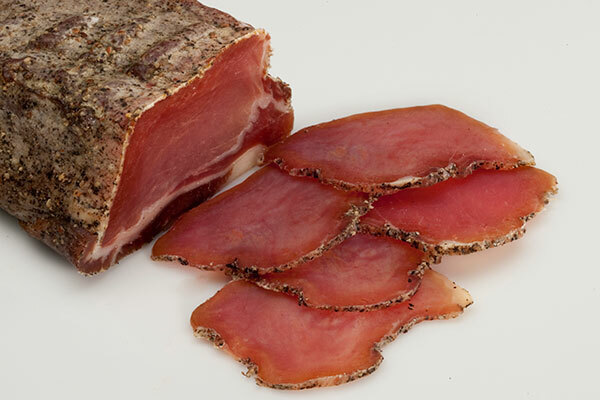 Its characteristics are obtained from a rigorous process of production which provides this ham with its organoleptic characteristics very much appreciated by the consumer: pink slice where you can appreciate the whole piece of ham. It has a pleasant taste and a soft and mellow texture. Packaging Formats: Vacuum-packaged whole piece • Vacuum-packaged ½ piece • 100g sliced portions packaged in a protective atmosphere. Description: this product is obtained from frying meat dices and pork fat. After the frying, the product is pressed to extract the lard and provide it with the necessary solidity to make it a crispy product and pleasant to the palate. It is very much appreciated as an appetiser or as a companion of salads, vegetables, etc. Packaging Formats: unpackaged 20cm diameter loaves of 15cm high • Vacuum-packaged loaves • In bulk • Packaged in 100g pots. 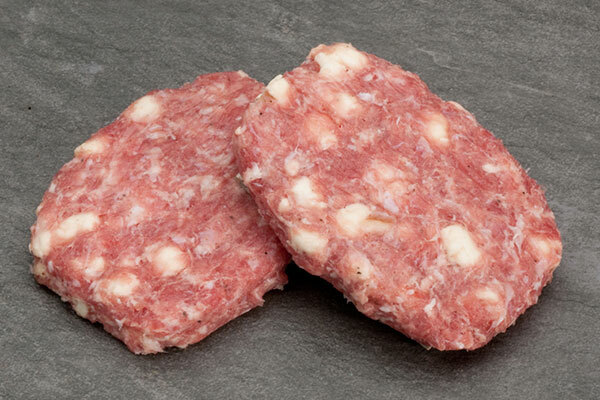 Description: this sausage is type-frankfurt produced, that is the meat is submitted to a very fine mincing, then stuffed in a casing to be cooked later. This cooking may be simple or applying a smoking process (Frankfurt smoked sausage). So that this product expresses all its organoleptic properties, it must undergo a cooking process prior to its consumption. Packaging Formats: Vacuum-packaged 1kg packs. • Vaccuum-packaged 4 units packs. Description: this product is made of the selection and neatness of the best pork bellies. They are spiced with salt, species and undergo a cooking and smoking process resulting in the particular taste and aroma of this product. It is suitable for hot snacks or to accompany other fast consumption dishes. Packaging Formats: Unpackaged whole piece • Vacuum-packaged whole piece • 100g sliced portions packaged in a protective atmosphere. Description: an entire pork loin undergoes a marinating and seasoning process similar to the cooked ham production. 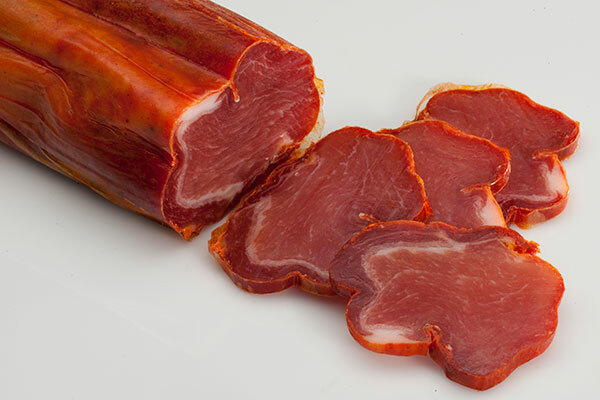 This makes these loin pieces take organoleptic characteristics very similar to the cooked ham but with the difference of the curing process when cooked. Packaging Formats: Vacuum-packaged ½ piece (approximately 1 kg) • Sliced portions packaged in a protective atmosphere. Description: this product results from the cooking of greaves. It is a highly valued product for cooking since its use gives a very particular taste and aroma. Besides, it is highly appreciated by the lovers of the Catalan traditional cuisine. Packaging Formats: 1 kg tub. • 1/2 kg tub. • 1/4 kg tub. 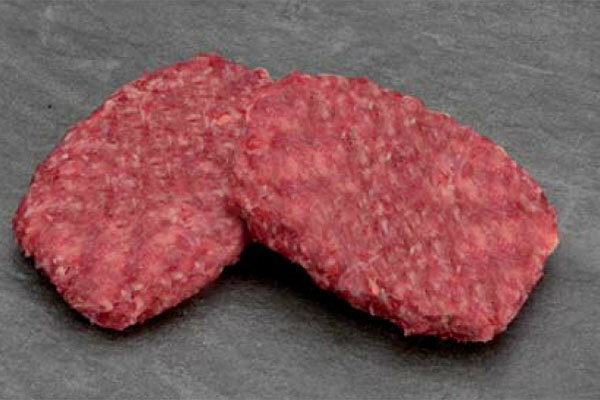 These products have been prepared with different types of meat: fresh, salted, seasoned, Catalan sausages (‘butifarres) or hamburgers depending on the type of product being prepared. They are fresh products ready to be cooked. 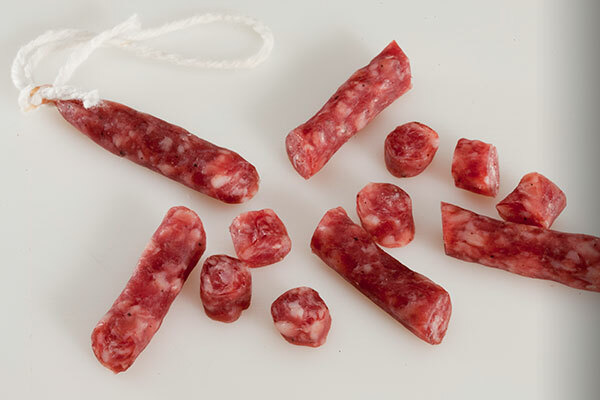 Description: this Catalan big sausage is considered one of the most classic sausages inside the traditional deli. 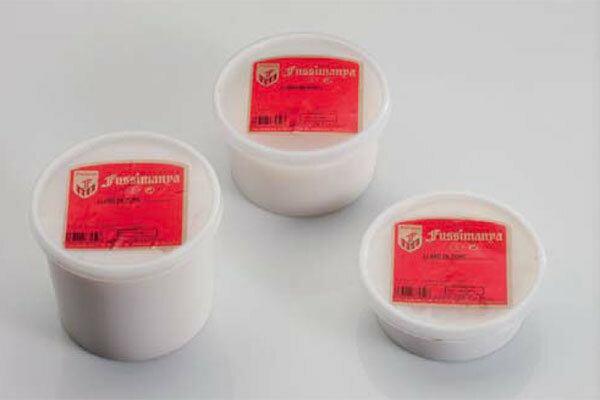 It is a fresh product that allows the consumer to taste the most basic properties of the pork and pig’s fat. 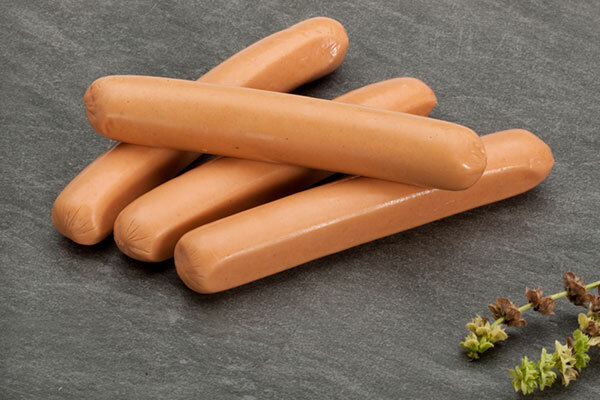 Currently, a wide assortment of sausages is made thanks to the combination of this traditional product with a wide range of ingredients. These products are marketed under the name of ‘butifarras’ made of several tastes, so you can find ‘butifarras’ made of ‘escalibada’ (traditional Catalan dish consisting of grilled red peppers, onions and aubergines), young garlic, mushrooms, asparagus, parsley, black olives, Roquefort cheese, chorizo, spinach, raisins and pine nuts, etc. Packaging Formats: pieces with a necklace shape • Sausage-typed strips • Strips of unknotted sausage • Pieces with a necklace shape packaged in clingfilm or in a protective atmosphere • Pieces with a necklace shape packaged in clingfilm or in a protective atmosphere (1kg). Description: it is made of the same meat preparation of the ‘butifarra’. The meat is stuffed in a thin natural casing. It is very much appreciated by children as well as to make hot sandwiches. 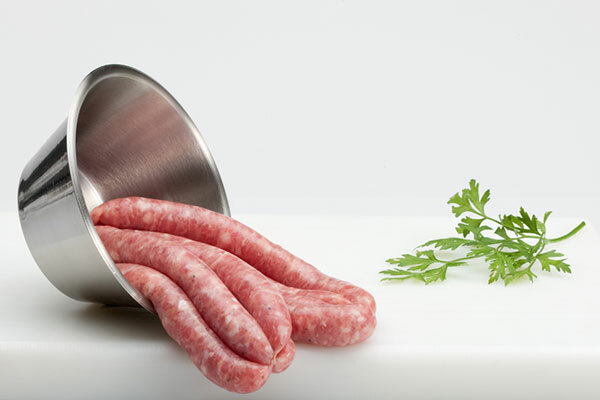 Packaging Formats: braided sausage strips • Trays of 6 units packaged in clingfilm or in a protective atmosphere • Trays of 1 kg packaged in clingfilm or in a protective atmosphere. 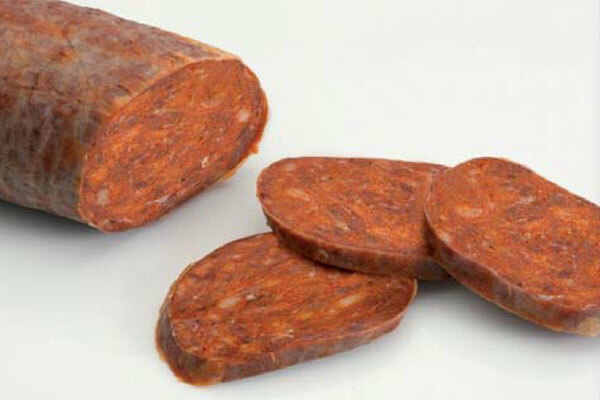 Description: this chorizo is made of a good selection of pork meat and fat that are flavoured with salt and spices being the red pepper the most outstanding one since it provides the product with its characteristic orange colour. When the product is fried, it’s when it expresses its main organoleptic characteristics. It is a product suitable for barbeques or to combine with other types of meat and meat products. 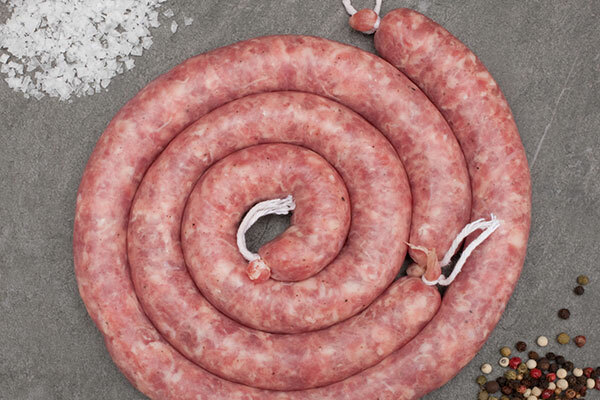 Packaging Formats: braided sausage strips • Trays of 6 pieces packaged in clingfilm or in a protective atmosphere. 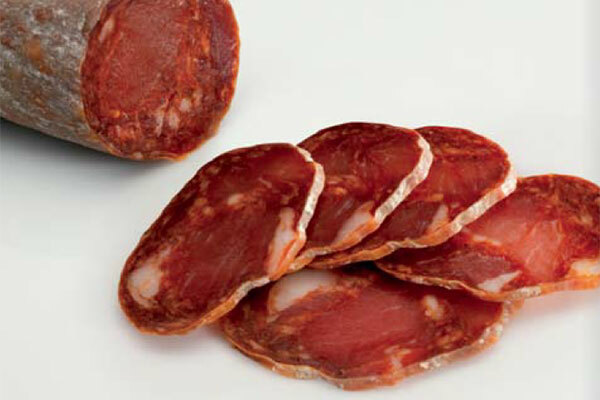 Description: it is produced with the same selection of meat as the ‘butifarra’ and seasoned with salt and pepper. Therefore, this product is marketed just before being stuffed. Description: this product is made with the same selection of meat as the rest of meat preparations. 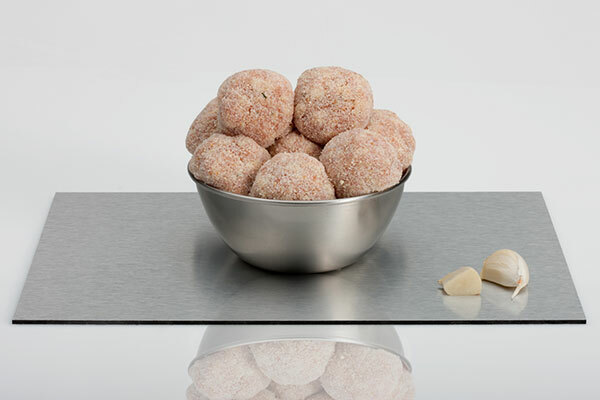 In this case, pasteurised egg, garlic and parsley are added to give the characteristic shape of meatballs. There are two varieties of this product: battered meatballs and meatballs wrapped in a natural casing. Packaging Formats: trays of 15 units approx packaged in a protective atmosphere. 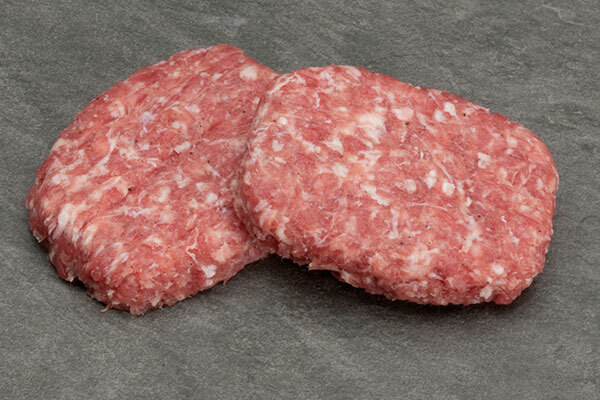 Description: this product is made of selected minced meat seasoned with salt and pepper. 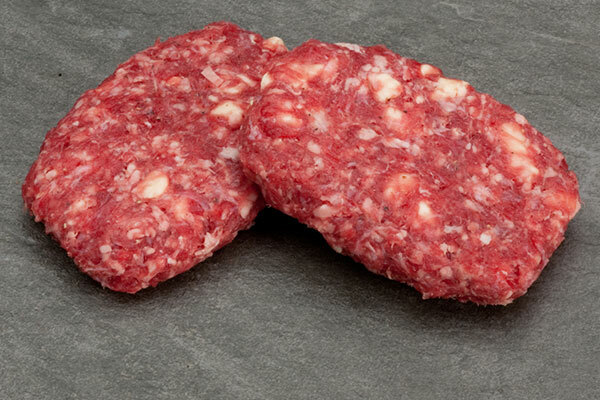 The minced meat is put into a mould to get the burger shape. 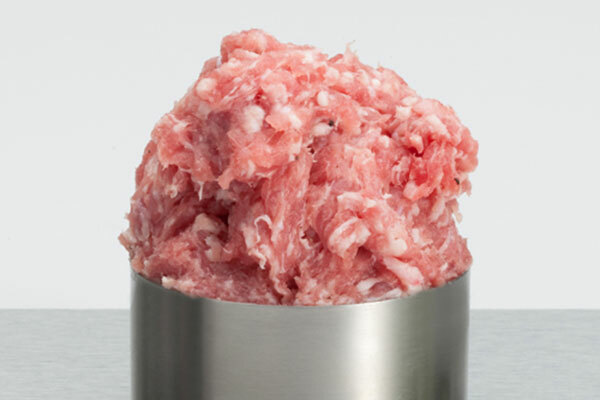 It is produced in different varieties as for its mixture of meat as to the ingredients that are added to it. Therefore you can buy pork burgers, beef burgers, pork and beef burgers, onion burgers, with cheese, with bacon and cheese, with meatballs meat, with spinach, etc. Packaging Formats: 4-piece tray packaged in a protective atmosphere • 6-piece tray packaged in a protective atmosphere • In bulk. Pork hamburger · pork hamburger with meatballs meat · veal burger · pork burger with cheese · pork burger with bacon and cheese · veal cheese burger. 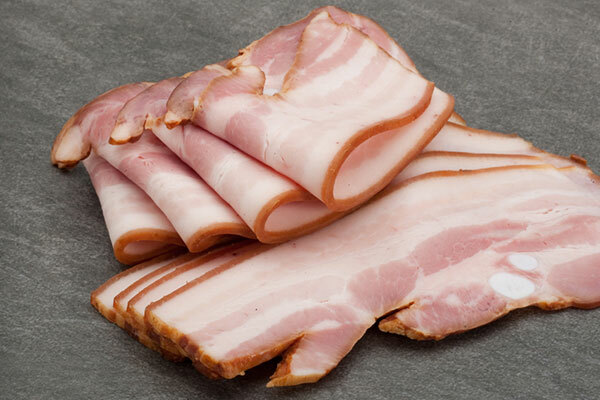 The meat used for the sale of the finest pork pieces come from selected pigs, mostly females, which have been fed with feeding stuffs made of a balanced selection of raw materials that make up a good proportion of fat and lean. This fact allows us to obtain meat with a pleasant colour, with little water content, but which expresses its best properties after cooking: tasty, but soft to the palate, with a pleasant aroma and suitable to be part of the best homemade dishes. HOW DO WE WORK IN OUR WORKSHOP?